The Arabian Nights Winter Collection introduced 8 lipcrayons to the permanent collection, along with 4 new shades of cheek sticks. I've fallen head over heels in love with the lipcrayons. These extremely pigmented, creamy, matte lipsticks apply buttery smooth, and leave the lips feeling soft and hydrated throughout the day. The lip crayons last for about 5 hours before fading, but they fade evenly and leave a lovely stain on the lips. Love, love, love these lippies! From left to right: Endlessly, Spy Pink, Day Trip, Rose Petal. From left to right: Le Mepris, Paprika, Red Lantern, Saffron. I was jumping for joy when I saw the four new cheek stick shades; you know I love the Cheek sticks in all their multitasking loveliness. These gems can be used on the eyes, face, lips, anywhere and everywhere! From left to right: Tea Rose, Neroli Flower, Damask Rose, Argan Tree. Does anyone else suffer from the "people's brow" when taking their own photos? Honestly, my right brow is a total camera whore! Addiction Dewy Glow Foundation in 03 biscuit. Addiction Cheek Stick in Argan Tree (blended into the hollows of the cheeks). 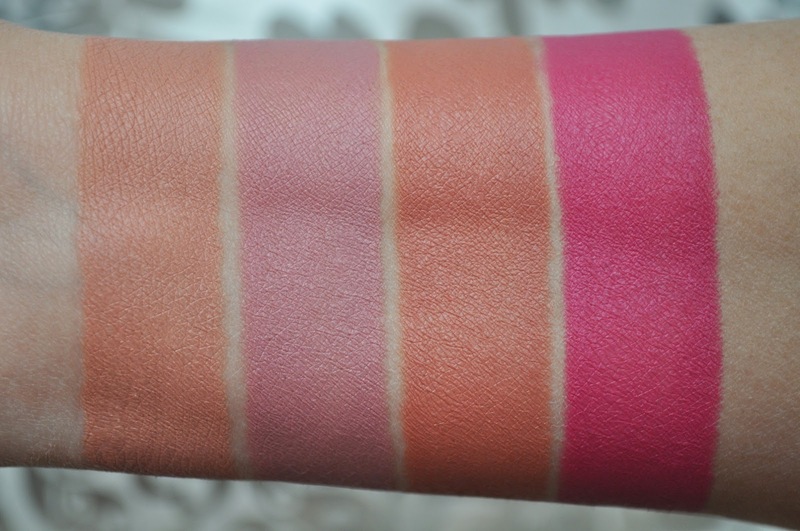 Addiction Cheek Stick in Tea Rose (on the apples on the cheeks). Addiction Eye Shadow in Mustard Tree (all over the lid, up to the brow bone, as well as the lower lash line). Addiction Kohl Eyeliner in Midnight Sun (the pale blue shadow placed in the inner corner. 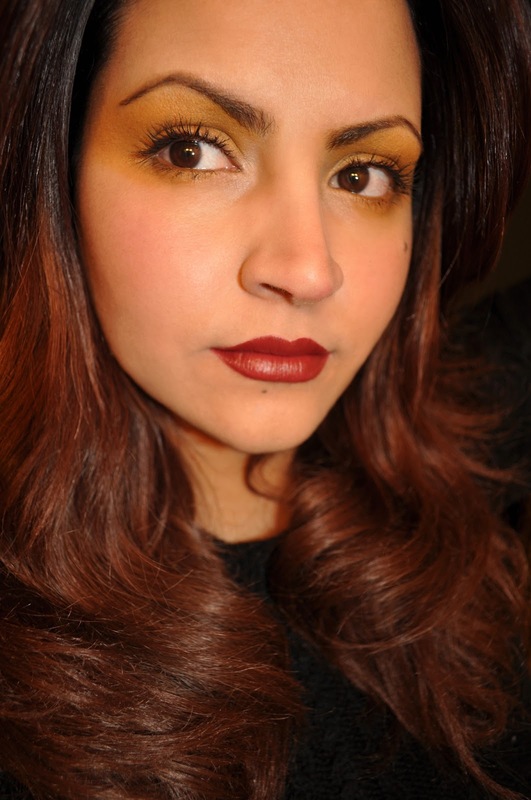 The dark brown used to lightly line the upper and lower lashline). Smashbox Lash DNA Mascara (on the upper and lower lashes). The Addiction Lipcrayons retail for ¥2,415($26.74), and the Cheek Sticks ¥2,940($32.55). Very pretty!! I love your perfect swatches! I am thinking about another Addiction purchase, featuring Tea Rose cheek stick and Saffron lip crayon. I have research and see if there is anything else I "need." Wow that is a stunning look. Saffron looks lush on you and the formula does not look one iota dry. 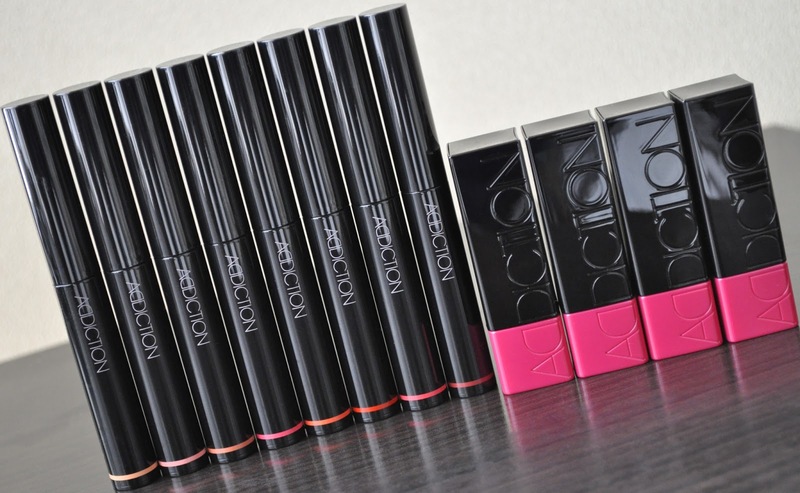 I'm head over heels in love with these lip crayons. How did you come up with that expression?? Mine is the left brow! If I massage above the brows at the end of the day, my left side is notabley more tense than the right side. I catch myself lifting that left brow ALL day without even wanting to. Ordered 4 of the new THREE duos. Skipped # 4. Just have to wait for them to arrive. Have your duo's arrived yet? Thank you for posting! The Cheek Sticks are lovely, and your FOTD is gorgeous : ) amazing blending with the blushers. and YES, I have one "arch" eyebrow and one "flat" eyebrow in most of my pictures too lol. it's absurd. These cheek sticks are divine! I'm glad I'm not the only one with a possessed eyebrow :P Totally absurd!